One more time, Prime Minister, read the Cabinet Manual: Parliament does not get to ratify the TPPA! ‘How many times do the Prime Minister and other members of the government have to be hauled up for misrepresenting the role of Parliament in making treaties, especially the Trans-Pacific Partnership Agreement’, asked Professor Jane Kelsey from the University of Auckland. 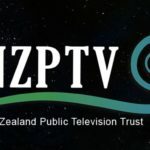 ‘The Prime Minister is either woefully ignorant of the fundamental process of treaty making, as set out in the Cabinet Manual, or he is wilfully misrepresenting the process to the New Zealand public’, Kelsey said. 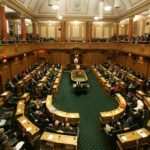 ‘At most, Parliament could refuse to pass legislation that is required to bring a particular law into compliance with the TPPA. But the government will have plenty of non-legislative ways to achieve compliance,’ according to Kelsey. Key’s right hand man, Stephen Joyce, has already had to correct a similar mis-statement in the House. 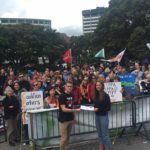 Chester Borrows apparently made a similar misrepresentation when speaking to protesters against the TPPA in Whanganui on Saturday. Both the ACT Party’s Ken Shirley and the Green Party’s Keith Locke have attempted to do so through private bills. National and Labour blocked both of them. ‘Until the government makes Parliament responsible for overseeing, signing and then ratifying treaties, they should be honest with the New Zealand public: the Executive, in other words the Cabinet, decides what to negotiate, instructs the officials, signs the treaty and ratifies it’, Kelsey said.